I Love My Pillow Review - Will A Memory Foam Pillow Help You Sleep? The founder of I Love My Pillow was working in a foam factory when he concocted the company’s “secret recipe” for the proprietary foam used today. The very first person to test his new material inside a pillow was his daughter who, after sleeping on it, shouted, “Daddy, I love my pillow!” Thus, the company’s name was born! Since then, I Love My Pillow has designed six different pillows ranging in firmness and feel, all brandishing the company’s logo in shiny thread. 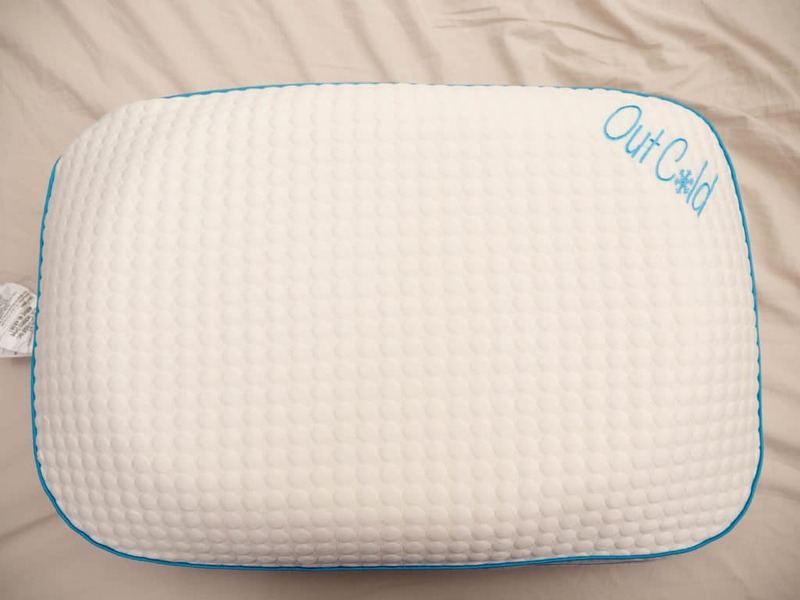 In this review, I’ll be exploring the most recent addition to the I Love My Pillow line — the Out Cold. Designed to keep you cool and comfortable, this pillow is built for every style of slumber. Things get interesting when you flip the pillow, though, as each side features a different construction. Could this dual-natured sleep accessory be the pillow I’ve been searching for? There’s only one way to find out! No time to read my full review? Click here to skip to my full review! WHAT IS THE I LOVE MY PILLOW MADE OF? 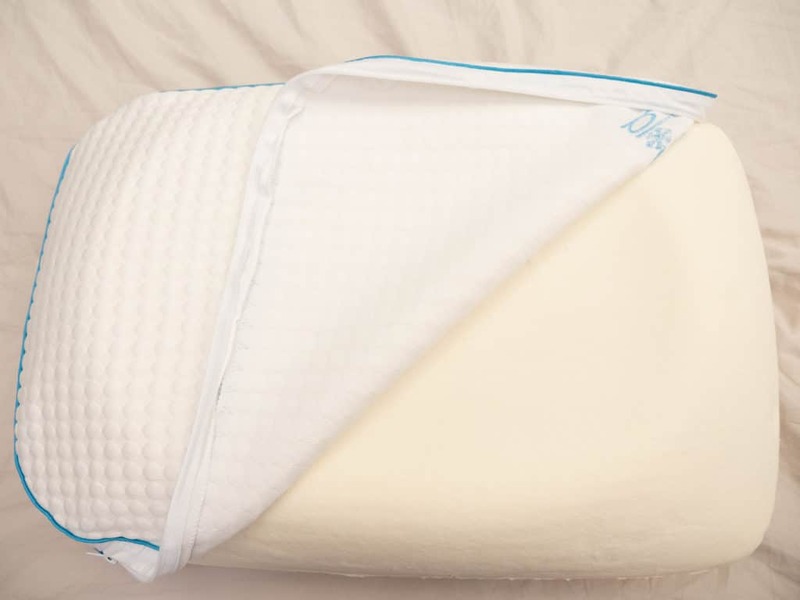 The Out Cold pillow from I Love My Pillow has two different fabrics covering each side. One side features a polyester based micromink material that offers a soft, velvety feel. The other side is the reason it’s called “Out Cold.” It’s made from a blend of polyester, cotton, and has the brand’s cooling phase change material known as CoolLuxe embedded into the fabric. Inside the Out Cold pillow is a proprietary blend of polyurethane foam that is actually made in the company’s hometown of Milford, Michigan. It’s designed to be a lightweight memory foam with a relatively quick response to pressure. It feels more breathable than some memory foams, helping the pillow to keep from warming up over the night, and enhancing the coolness of the “cold” side. 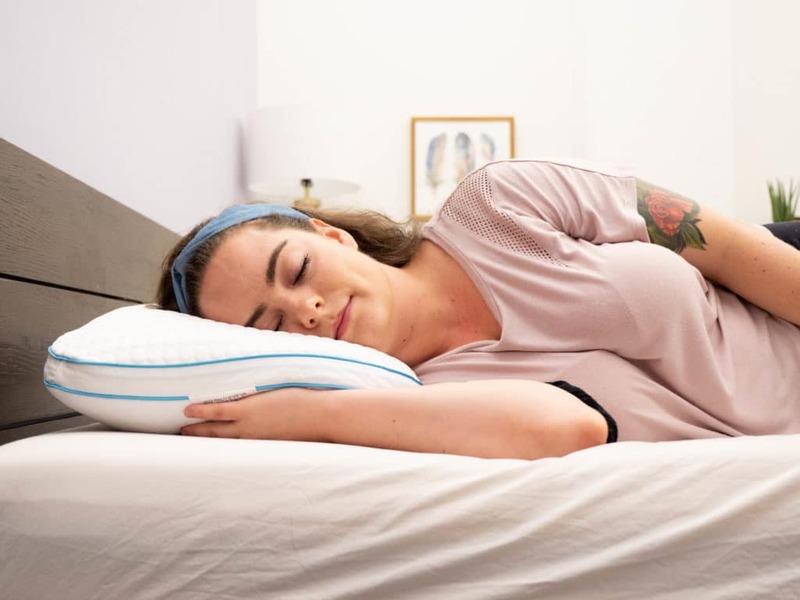 The cool side of this pillow is slightly contoured in the center to provide extra support for the head and neck, particularly for folks who sleep on their backs or sides. This shallow indent is meant to conform to the sleeper’s shape, and help align the spine. While the people at I Love My Pillow made this to be an all-position pillow, they say that the contoured side is meant to offer back and side sleepers the best support. The other side, covered in the micromink material, is the “traditional” side with no contour. This means it’s got a bit more foam than the other side but, since it’s the same type of foam, it offers a similar firmness. Because the surface of this side of the pillow is flat, it’s more recommended for stomach sleepers. Although, the extra foam of the traditional side does make it a bit thicker with higher loft. The pillow, as a whole, is designed to be more flexible than foldable. It’s got a lightweight feel and has a quick resilience when you press into it. This pillow was designed with a duality meant to cater to the needs of every style of sleeper, especially those who need help staying cool. HOW DOES THE I LOVE MY PILLOW FEEL? 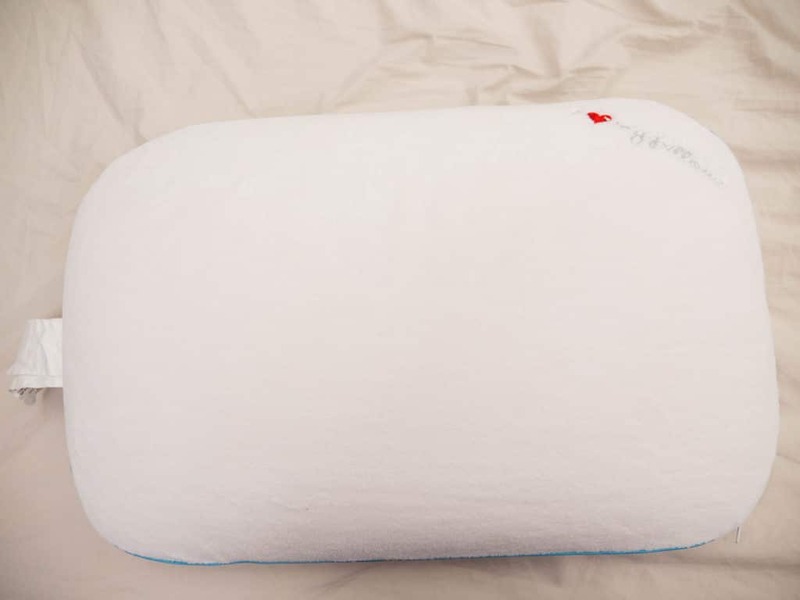 The Out Cold pillow from I Love My Pillow has a dual nature to it in that each side is made from a different fabric, and one side has a contoured shape. So, each side of the pillow is going to offer a different feel and level of support. One side is cool, and one is temperature-neutral. One side is slippery-smooth, and one is fuzzy-soft. And when it comes to support, one side is built to cater more to back and side sleepers, and one is intended more for stomach sleepers. On the contoured side, the CoolLuxe material is woven into the fabric itself, so it always feels icy and crisp to the touch. It’s designed to pull heat away from your body, and the cooler you keep your bedroom, the cooler this side of the pillow will be. The cover feels slick and smooth and rests pretty tight against the material (you can’t bunch the cover fabric up with your fingers). The shallow contour of the cool side creates a cradle for the head and neck, sort of softly securing you in place. The foam feels light and flexible and sort of hugs your shoulders, but it doesn’t really offer you much sink into the foam. Instead, it feels like your head is resting on top of the material. Because of the way the contoured side conforms to your head and neck, the company says it might be better suited for back and side sleepers. The sides of the pillow are loftier to provide extra support for folks in the lateral position, and the indented middle offers a lower loft for supine sleeping. Both sides of the pillow are said to offer a medium firmness, however, the traditional side is not contoured in any way so it actually employs a bit more foam than its counterpart. Because of this, the traditional side of the pillow offers more of that memory foam sink than the other side does, but it also increases the firmness. In my experience, the traditional side is a little closer to medium-firm than medium. The foam lightly conforms to the pressure of your head and adapts as you change positions. This flatter more adaptable side is better for combo sleepers, particularly stomach sleepers who need an even surface. The micromink cover fabric of the traditional side is incredibly soft and has a fuzzy, velveteen quality to it — very different from the slippery, glossy feel of the other side. The fuzzier fabric is definitely warmer in comparison to the cool side as well. Each side of this pillow is so different, it’s almost like having two. WHAT DID YOU THINK OF THIS PILLOW, SARAH? So, before I even get into how this pillow felt for me, I have to give props to the adorable design. You’ve got the cool side that has the words “Out Cold” sewn into the fabric in light blue lettering with a little snowflake where the “o” would be. 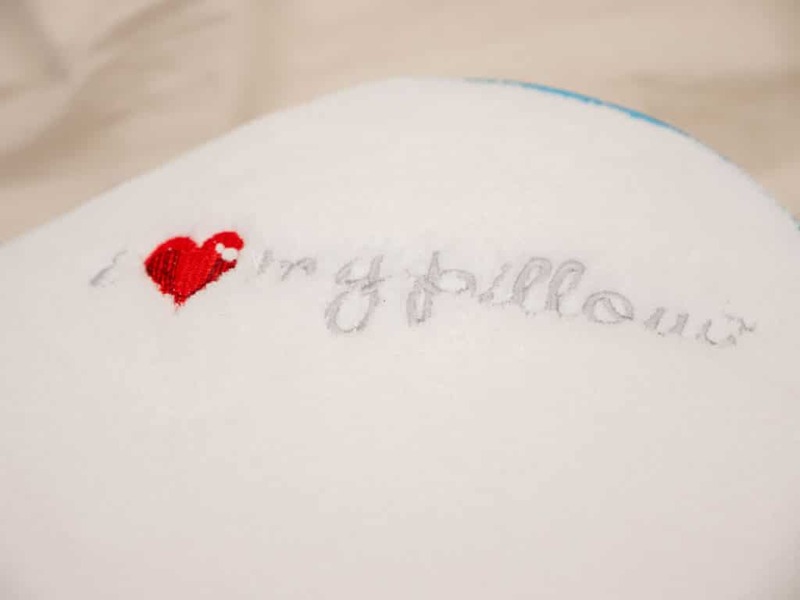 And on the fuzzy, micromink side are the words “I <3 My Pillow” in silver, cursive writing with a bright red heart expertly sewn into the fabric. In the culinary business, they tell you that people eat with their eyes first. Well, in my opinion, the same goes for sleeping. After rubbing my hands all over both sides of the pillow, I worked up a hearty nap-appetite. I could tell right away that each side had a very different personality, but because I’m a hot sleeper, I couldn’t resist starting with the cool side. I fell right into the supine position for some cozy back sleeping. I was intrigued by its contoured shape and I had a feeling that its shallow indent was carved out specifically for this purpose. As I laid into it, I was a little surprised by its firmness. It’s not the loftiest pillow, so I guess I wasn’t expecting to feel so propped up. Aside from this side’s contour, my head didn’t really sink into the pillow much at all. Instead, it was cradled securely in place. Lying on my back, I could feel that the pillow’s shape was helping to guide my posture into neutral alignment. I definitely felt a quick response to pressure and as I turned my head to the left and right, the material would bounce back right away. The foam definitely had more of a lightweight feel than most memory foam I’ve tested which I kind of liked because it made the pillow feel more breathable. And I couldn’t stop rubbing my hands all over the icy-crisp cover fabric. After lying on my back for a while, I definitely felt like this pillow was keeping me cool and comfortable. So, I rolled over onto my side to see how it handled some lateral sleeping. While the cool crispness of the cover fabric really never got old, I found the edges of this pillow to be a little too low for my liking. When I’m on my side, I like the pillow’s edges to have a lofty, firmer build that I can fold and shape to my liking. But this pillow isn’t very moldable, and while the edges have higher loft than the center, it has a pretty low loft in general. The foam is flexible though, so I folded one side under to prop the loft up a bit and it did serve to relieve some pressure in my shoulder. I felt like the contoured center was great for keeping my head and neck supported when on my back, but I just couldn’t settle into the perfect position when I was on my side. So, rather than trying to force it, I moved onto my stomach. Now I already knew that, according to the people at I Love My Pillow, the contoured side is more intended for back and side sleepers. But I tested it on my stomach anyway! And sure enough, the uneven surface was not conducive to stomach sleeping. My head was cradled in place like it was when I was on my back, but with my face pointing downwards, it felt a little more suffocating than secure. The slightly loftier edges enveloped my face in an unpleasant way, and the medium-firmness caused my neck to crane slightly. After testing the contoured side in every position, I was pleased to feel that it hadn’t lost one bit of its coolness. 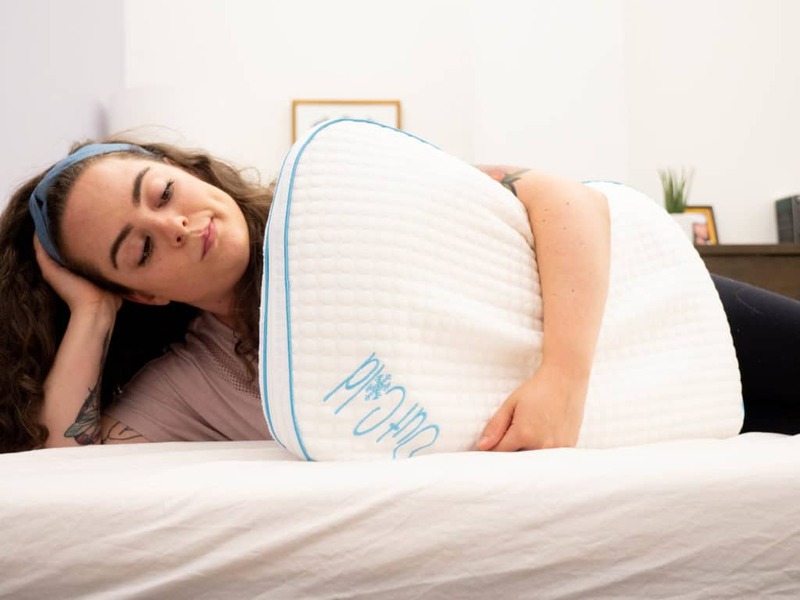 Back sleepers who need help maintaining spine alignment and keeping a cool body temperature could definitely benefit from this pillow, in my opinion. So, I flipped the pillow over to see how the “traditional” side felt. Firstly, the cover fabric couldn’t be more different. Instead of the icy-smooth quality of the cool side, the micromink material felt like snuggling a giant beanie baby. It was plush, fuzzy, and so cozy. So, I laid on my back to see how it felt in comparison to the other side of the pillow, and right away I could feel that I wasn’t getting that same sort of contoured support. The traditional side of the pillow has a flat surface, and while that allowed me a little more sink into the material, it didn’t cradle my head in the same way. I almost felt like the firmness was a little too much and I really missed the shallow indent of the other side. Sleeping on my back, the loft wasn’t too high, but the medium level of firmness combined with the foam’s quick response to pressure made me feel a little too supported. I felt like I needed a little more give, more of a fluff factor. That being said, sleepers who like a more firmly supportive pillow when supine sleeping would likely benefit from back sleeping with either side of this pillow. So, I rolled onto my side. I know the company suggests that the contoured side is better for lateral sleeping than the traditional side, but I found the opposite to be true for me. The added foam served to give me that extra bit of support I need when I’m on my side, and the even surface made me feel freer to roll from side to side. Just goes to show that every sleeper is different! I still slipped an arm beneath the underside of the pillow for a little extra comfort, and I didn’t find that that propped me up too far. Lying on my side, I was surprised to feel that even the micromink side of the pillow did not seem to be trapping my body’s heat. It didn’t feel cool, necessarily, but it was not warming up either. I was a little surprised by that, actually, because I typically associate “fuzzy” with “warm”. Not to mention, foam does have a tendency to trap heat, so this lightweight memory foam was doing a good job allowing air to flow through the material. Rolling onto my stomach was an easier transition than with the contoured side, and the flat surface was definitely more conducive to keeping healthy posture. However, I still found that the firmness was a little too supportive for stomach sleeping. When I’m on my stomach, I like my pillow to be fluffy, foldable, and easily compressed. This pillow really isn’t any of those things. That being said, I didn’t feel as though my head or neck was craned in an uncomfortable way, and I could certainly see how many stomach sleepers would find this side of the pillow to be comfortable. It offers a nice sink into the memory foam and provides even pressure relief no matter where you lay your head. But if you’re like me and prefer only the slightest bit of cushion between you and the mattress when you’re on your stomach, I’d recommend testing this pillow before you commit. When it comes to these styles of sleeping, I do prefer a lofty, fluffy pillow. So, I didn’t really find the Out Cold pillow to be ideal for holding between my legs or under my arm. Because one side is contoured, the support between my legs felt uneven. The firmness served to prevent my leg from sinking to the bottom of the pillow which I liked, but I like to be able to fluff the pillow between my legs a bit which I couldn’t really do with this pillow. Plus, the flat feeling of one side sort of clashed with the indented feeling of the other and made my hips feel a little off kilter. Using it as an under-the-arm-hugger was a little better (especially because the cover fabric is so snuggly-soft on one side), but it’s lack of fluffability detracted from the comfort I look for with this style of resting. I like the feel of a lofty pillow with some heft to it under my arm, and the lightweight nature of the foam just felt a little too thin. 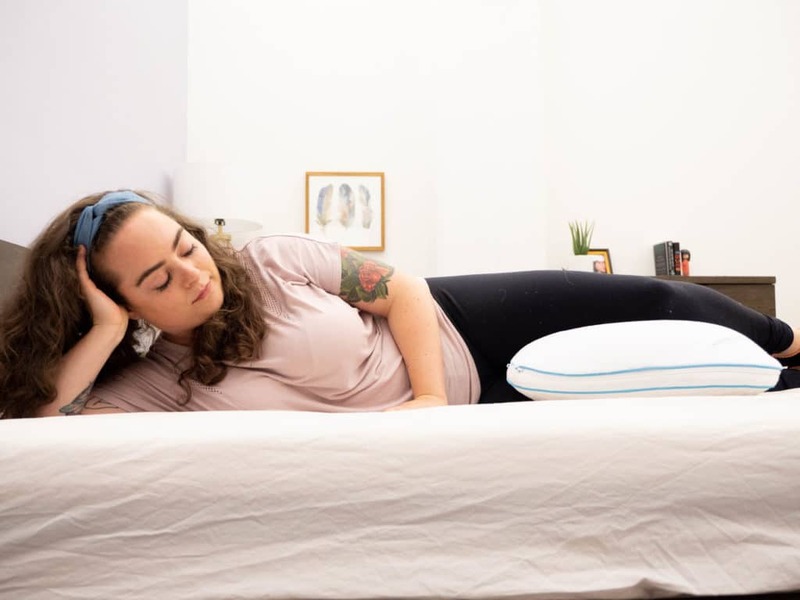 Overall, I think that every style of sleeper could find a comfortable position using this pillow, but I do think it takes a little patience and pillow-flipping to find it. I think back sleepers are going to be best suited to the contoured side, and side and stomach sleepers are going to do better with the traditional side. Stomach Sleepers — Stomach sleepers often prefer a softer, flatter pillow to ensure healthy spine alignment. However, neither side of this pillow is very soft or easy to flatten. The medium firmness and quick response to pressure can make it difficult for some stomach sleepers to find their comfort zone. 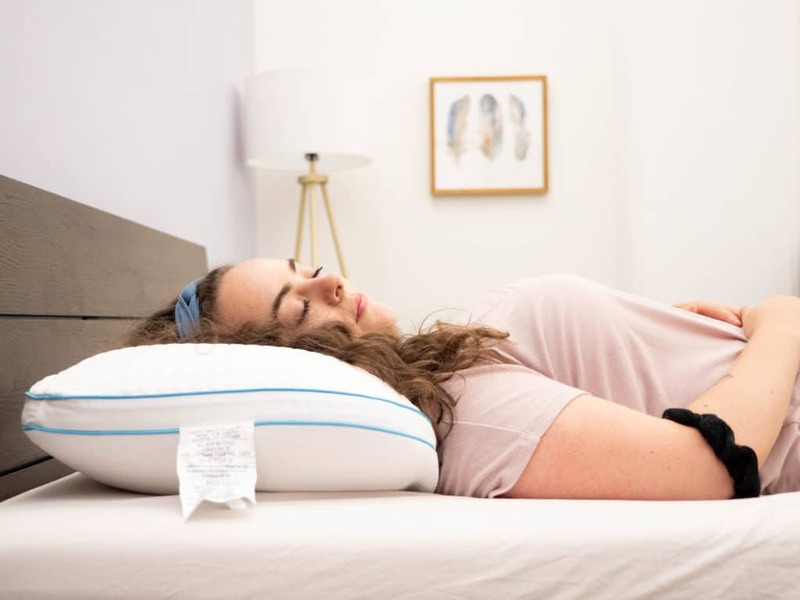 Side Sleepers — Conversely to stomach sleepers, side sleepers often prefer a loftier build in order to relieve pressure in their shoulders and help maintain neutral spine alignment. However, neither side of this pillow is very lofty, and the lightweight nature of the foam can make it easy for the sleeper’s head to lose support when in the lateral position. Not Fluffable — Many sleepers like to be able to play with the shape and loft of their pillows by fluffing them, but he foam inside the I Love My Pillow is neither fluffable nor shapeable. It has a lightweight, flexible nature to it, but it does not offer a cushy or feathery feel. SHOULD I TRY THE I LOVE MY PILLOW? Runs Hot — The CoolLuxe material that’s woven into the fabric of the “cool side” helps to draw heat away from the sleeper. 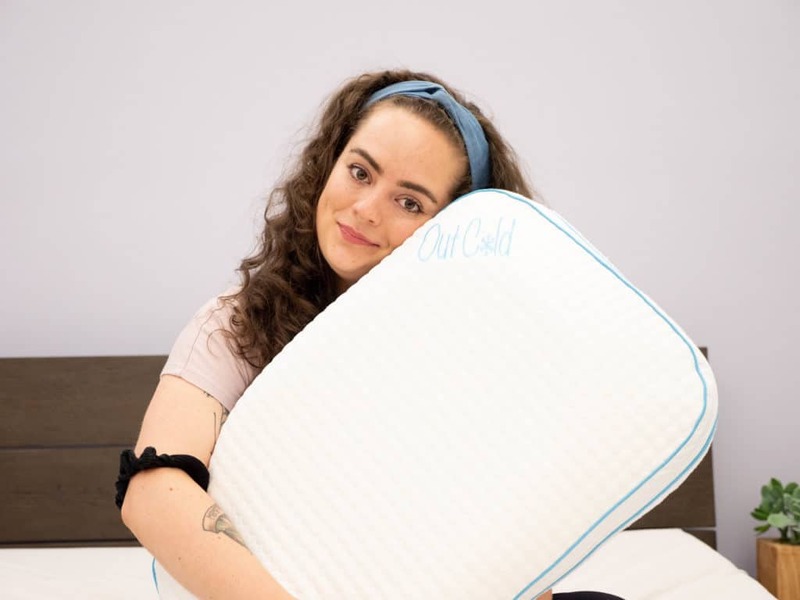 It’s got an icy-crisp feel to it, and because the cooling feature is embedded into the fabric, it does not wear away in the wash.
Back Sleeper — In my experience, this pillow was best suited to back sleeping, especially on the contoured side. Back sleepers who like a more firmly supportive, body conforming pillow would probably be quite compatible with this pillow. Likes Memory Foam — I Love My Pillow’s proprietary foam is designed to be lightweight while still offering that signature sink into the material. Folks into the feel and support of memory foam, but want a little light breathability might love this pillow. Wash Instructions — The cover of this pillow is removable and machine washable. Just wash with cold water and mild detergent on a gentle cycle. Then, tumble dry low. Do not bleach or iron. The foam cannot be washed in the machine, so spot clean with mild soap and water. 100 Night Trial — I Love My Pillow offers a trial period of 100 nights so that you can test it out before fully committing. If, after 100 nights, you’re still sure the pillow isn’t for you, just send it back for a refund. Warranty — Every pillow is backed by a three year manufacturer warranty and is assigned a unique pillow number for you to register. Click here to learn more about the I Love My Pillow! The I Love My Pillow series is quite impressive. All 3 of these pillows provided a quality level of contour and support in addition to great cooling. Whether you’re a back, side, or stomach sleeper, at least one of these pillows will get the job done. If you’re a fan of the sharper contour in the pillow department then the I Love My Pillow series should not go overlooked.